Unlike some other vintage and newer classics, modded Mustangs are not frowned upon by Ford Mustang enthusiasts. 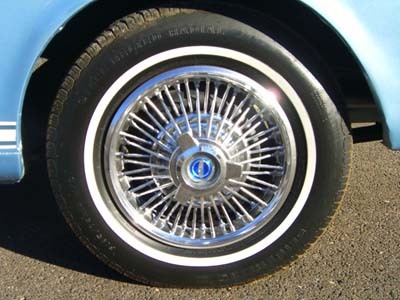 By far, the easiest and high impact modding is changing out the original Mustang wheels and tires for a more aggressive and custom looking stance. Not only that, but we all know that save for some ultra high-end exotics, the best all out performance tires are probably not the ones that came equipped on your Ford. In the old days, you modded your suspension, by adding air shocks and jacking up the back of the car to clear those big tires from the wheel wells. And of course, to make them look like those famous cars we saw out on the drag strip. Nowadays, the way to go is low...low...low. But stay away from cutting pieces out of your coils. All that does is make your Mustang ride like a truck and bottom out when you drive over pebbles. 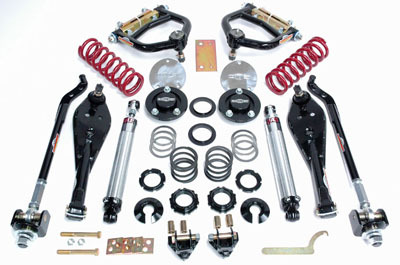 Professional lowering kits are relatively cheap and preserve your suspension, handling and tire life. If you really want to bottom drag your car you either need to go with a hydraulic dropped suspension or air bags. These modded Mustangs are all about the look, not handling and as far as I've seen so far, save for some factory airbag and hydraulic suspensions (eg Mercedes, Cadillac) no aftermarket kits are out there that can give you a choice of low rider stance and high quality handling. Clearly, the original classic Ford Mustang was not a piece of handling and cornering success, not even when for it's time. And while adding better shocks, stiffer springs and a thicker sway bar at the front and rear can make a huge improvement compared to stock performance, the limits of how far you can go, is based on the original engineering. But if what you seek is modern crisp handling, then you need a whole new modern system. And that's where companies like Art Morrison Performance come in. You can start with the addition of basic subframe connectors to stiffen your unibody chassis, or go to a full suspension subframe that replaces the entire underpinnings with track proven modern components. Others address front suspension changes with almost bolt in upgrades, converting the original upper and lower A arm suspension pieces with a modern coil-over setup and rack and pinion steering, that fits in the stock location, requiring no more than removing the original pieces, drilling holes and bolting on a whole new level of performance. Just the thing if you plan on adding a lot more horsepower! When you think of modded Mustangs, chances are, you're also thinking of cars with extensive engine modifications. the great thing about most years and engine choices of the Ford Mustang is that high performance parts are plentiful and mods are for the most part, fairly simple. Adding headers and a larger diameter, freer flowing exhaust system are probably the most popular Mustang engine modifications. Next up the line, is modifying the engine for more performance. Typical popular power adders, include freer flowing cylinder heads, a performance intake manifold and bigger carb, or performance intake plenum and larger mass airflow sensors plus a new "tune" for computer equipped cars. The ultimate for modded Mustangs may well be a supercharger or a turbocharger kit , which can kick your Ford Mustang's performance through the roof! The sky is the limit for classic and newer Mustangs. The Performance parts section of the site goes into much more detail about these parts, including how they work, and best bang for the buck. The Performance parts section of the site goes into much more detail about these parts, including how they work, and best bang for the buck. Love the idea of a big block shoehorned into your ponycar chassis but can't bear the idea of a 10 mpg car in these high priced gasoline days? 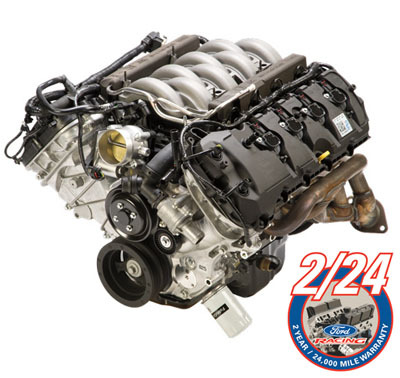 Ford Racing has come out with a crate version of the amazing new 5.0 liter V8 Coyote engine. Add your new harness and the engine computer and you have superior performance, a 7000 rpm redline and a car that practically "sips" fuel, compared to a big block V8 with similar output. And as you see in the above picture, it now comes complete with 2 year or 24,000 mile warranty. Try to get one of those from your local machine shop. Expect to see a lot more of this, including swap parts to make the conversion swap into not only classic mustangs, but fox body cars and even newer versions as the new NMRA Coyote Stock Class starts to take hold in drag racing! A 10 second car was never easier to build !